China Manufacturing PMI at 9-Month Low! 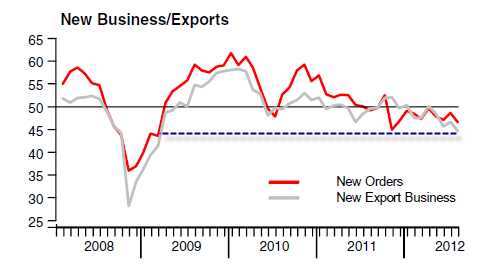 Adding to the grim news on global growth, the HSBC Flash China Manufacturing PMI shows new export business declines at sharpest rate since March 2009. 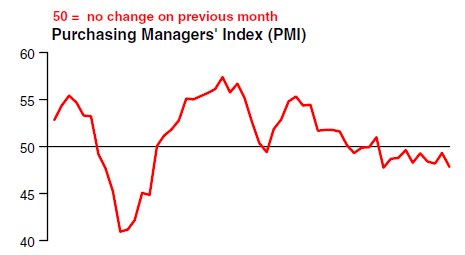 Flash China Manufacturing PMI™ at 47.8 (49.3 in July). 9-month low. Flash China Manufacturing Output Index at 47.9 (50.9 in July). 5-month low. Notice the sheer absurdity of the proposal: “Beijing must step up policy easing to lift infrastructure investment in the coming months”. China is loaded up with malls with no shoppers, trains with no passengers, and even entire cities where no one lives, and economists want or expect China to start more infrastructure projects.